The main one is an Atmel SAMD21, this chip is in charge of all the normal tasks like reading the sensors, saving data, interacting with the user, etc. For this chip we need two software components the bootloader and the main firmware. 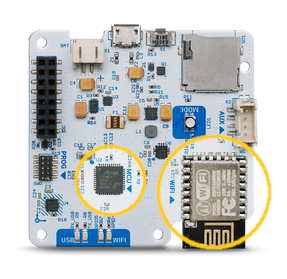 For communications the SCK has an ESP8266 microcontroler with Wifi capabilities, this chip receives instructions from the SAMD21 via serial port and takes care of publishing the collected data through the network. This chip needs a main firmware and a filesystem that stores the web pages for the setup mode server. The SmartSmart Citizen Kit Firmware is on our repository on github so you will need git software installed. To build the SmartSmart Citizen Kit firmware you need a linux computer with platformio installed, you don't need the full IDE installation (Atom). You can follow this instructions to install only the console version. For bootloader upload you also need OpenOCD somewhere in your PATH. 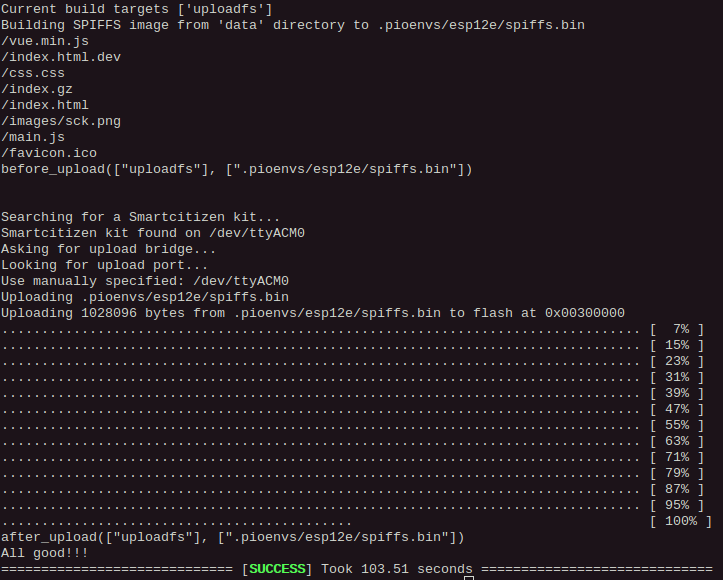 You can use platformIO provided binary, normally it is located in ~/.platformio/packages/tool-openocd. 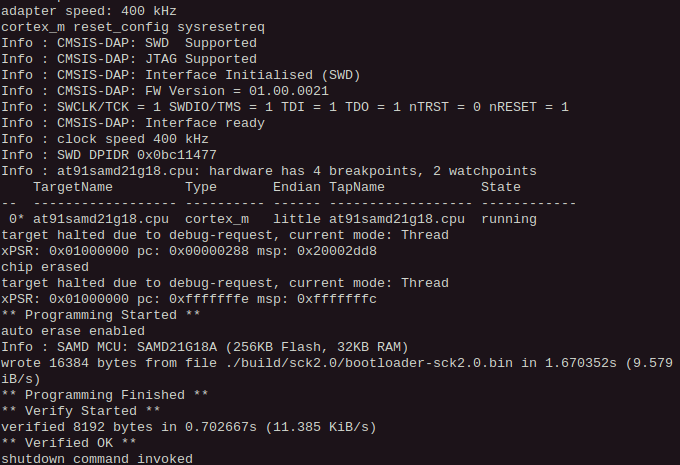 The bootloader repository is a submodule of the main firmware so you must do a --recursive clone to get it. I you download manually (with the clone or download button on github) you will not get the bootloader code, but you can get it from here. If your kit doesn't have the bootloader already flashed (all the kits that we ship come with it) you will need an ATMEL-ICE programmer. This process can also be done with a Raspberry Pi computer and the proper connector and cables, we are preparing the documentation for this process. 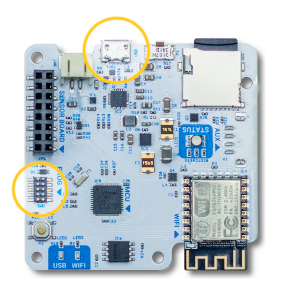 Connect the Atmel-ICE programmer to the 10 pin SWD connector and to your computer. Power the SCK via USB, you can use any USB charger or even your computer. 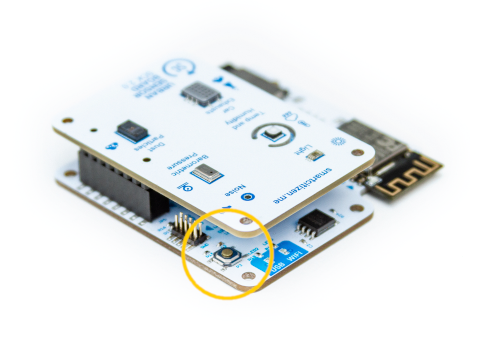 You are ready for the next step, just remember to disconnect the Atmel-ICE programmer and connect the SCK to your computer with a USB cable. The bootloader we just flashed allows a very simple way of uploading the SCK firmware based on the UF2 format, when you double-click the reset button of your kit it will expose a MSD interface to your computer and a new drive will popup where you can just drag the compiled firmware file (converted to UF2 format). 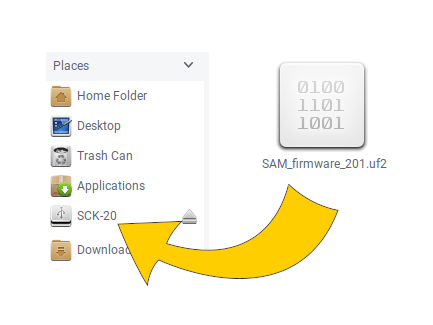 The script will leave a copy of the compiled software in UF2 format called SAM_firmware.uf2 you can use this file to reflash your kit without compiling it again. don't worry about the NO DEVICE WAS FLASHED message, we are doing it manually. Now double-click the reset button of your kit open your favorite file browser and drag the file you just created to the SCK-2.0 drive. The kit will reset and run the new firmware. Keep in mind that if your computer is not configured to automount new drives you will need to mount your sck manually (as any other USB drive). As before, if this is the first time you do it, it will take a while on downloading dependecies and building the firmware. Sometimes the ESP8266 and the uploader software don't get synced and the upload fails. Normally if you try again it will work.